I think I spent alot of last month eating potatoes. Potatoes with everything. It's just something about being able to eat what you want, when you want. I kinda fall into a cycle? Maybe I just went to Sam's club and got the huge box of fires. The one with like six huge bags. Why am I talking about fires, oh cause of Lomo Saltado. Looking at the pictures on Wikipedia, I see I did it my way. I'm not one for following the way it should be done. I put more sugar in kool-aid then should be, hell I mix two or three favors at a time. Yeah, I live on the wild side. 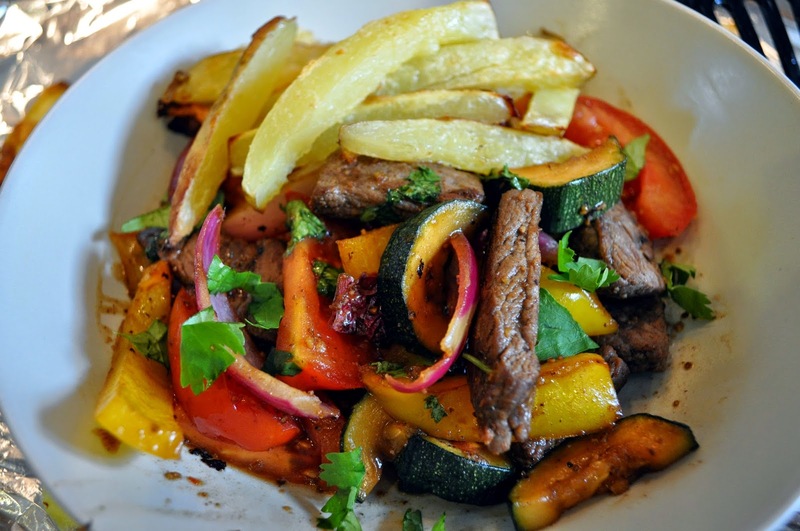 Here's my Lomo Saltado recipe. Listen to 2Pac while you make it. Cut the potato lengthwise into 1/3-inch thick slices; cut each slice into 1/3-inch fries. Place on the baking sheet and toss with oil to evenly coat. Season with garlic powder, salt and pepper. Place on a single layer onto the greased baking sheet. Bake uncovered on the lower third of the oven for about 25 minutes or until tender crisp and golden. Heat a large wok over high heat. When hot add the oil and the steak, cook about 2 minutes, until browned on both sides. Add the onions, bell pepper, jalapeno and garlic and cook 2 minutes. Add the tomato, soy sauce and vinegar and cook 1 more minute. Season with more salt as needed, remove from heat and finish with cilantro. Serve immediately with french fries and divide evenly between 2 plates. This post is sponsored by Super Wal-Mart/Sam's Club.